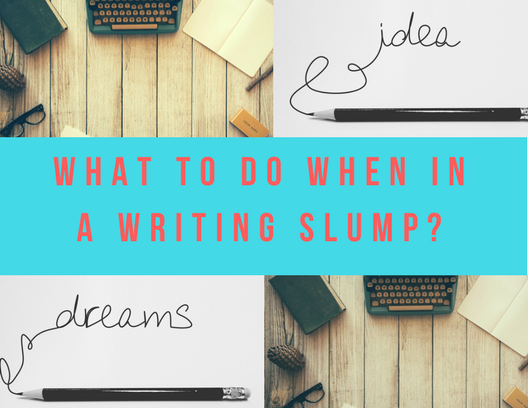 What to do when in a writing slump? Writing slump occurs when I am stressed and have a lot on my plate. Or frankly, I am lacking motivation because my mood is not up to par. I have all these ideas running through my head and suddenly I hit a brick wall depending on how my day, week or month is going. Do you sometimes find yourself in a writing slump or lack the motivation to get a task done? Life throws curve balls often and as I get older I realize more and more that I have to figure out how to hit them out of the park anyway. By any means necessary. Now, does that mean each time I swing at the said ball I don’t strike out? Absolutely not! I often miss and must dust myself off and get my head in the game to overcome my writing slump. There are many reasons you may find yourself in a slump. Busy! There are more things on your plate than there were before. Uninspired! Let’s face it. Every day will not be full of inspiring things to get your creative juices flowing BUT there are ways around this. Road Block! You have run out of ideas and need to adjust your thinking cap. Life! Things will occur that you have no control over and must figure out how to overcome the hurdle. In an attempt to avoid a writing slump here are a few things I attempt to do but I won’t lie I am not always successful, LOL. Plan! Set a schedule for you to follow. By doing so you will have it “set in stone” the days you have set aside to focus just on writing. Don’t get upset or feel like you failed if you don’t stick to your schedule because remember life happens. Just don’t make it a habit to not follow through. Notepad/Recorder! I often find I have ideas that pop into my head while I am out and about. So what I like to do is keep a notebook and pen on me at all times. I have also started to use my built-in recorder on my phone so while I am driving, etc. I am able to just let my thoughts fly. Once I am near my computer or have something to write with I can listen to what I recorded and expand from there. This comes in handy when I am stuck. I just revisit my thoughts and go from there. Meditate! Okay, this may sound a bit odd but when I am in any kind of slump, not only a writing slump, I like to meditate. I can clear my mind of all unnecessary clutter and relax. It allows me to start fresh and think clearly about the task at hand. Less stress and being in a better mental state will help with being in a writing slump. Avoiding writing slumps will not always come easy. But when they do occur burn some incense, blast some music (or play it softly if you prefer) and get into your creative zone. Sometimes slumps are here to remind us that, “hey, you’re going a mile a minute and need to chill out”. Don’t push yourself to the max and attempt to force something. Let it come naturally and until then find a groove that works for you to overcome your writing slump ASAP. Meditation actually helps your mind relax and even if you are busy, you will feel much better, energized even, after a 10-15 minutes session. It is recommended to buys people. I was recently in a meditation class where I’ve been told that meditation also equals the two parts of the brain: the creative one and the intellectual one. So this is really good advice, to meditate when we need some inspiration. I find myself in a writing slump more often that I’d like to admit! These are great tips, thank you! Man. I really needed to read this. I get so discouraged sometimes when it comes to writing and find myself having writer’s block for longer than I appreciate. Thank you so much for sharing these tips. Hoping that they help me in the future! I get in a writing slump often, it really bothers me when that happens. What I usually do is leave it alone for a while so I don’t stress myself out. I’ve found setting days for writing works better for me and meditation. I completely identified myself in your two last tips – for me what works best really is taking a break and relax a bit, maybe go for a walk in the park, just change scenario for a bit. Carrying a notepad is always a must because you really don’t know when inspiration will strike. This is so true. Relaxing gets me in my zone but sometimes it’s so hard to quiet my brain and go with the flow. I’ve been writing everything down. Either in a note in my phone or on a notepad. My creative writing is slowing down, so my main writing is the blog. Great minds think alike ;). I like to use my phone for this as well. It helps me often. Very useful post. I think we all loose inspiration sometimes, but we should find it again and don’t give up. What a perfect timing of this post, I am in the same situation these days, and it comes and goes, maybe fall weather has something to do with it. I am sure these suggestions are going to be helpful for me to have that motivation to bring out my creativity. Creative block is a genuine problem! Love your pointers! Meditation has been a beneficial activity for me! These are really helpful information and suggestions.We really need inspiration on writing it’s a big help, and we should relax and take a break. These are some really great tips. Thanks for sharing this as I often struggle with writers block. Slump in any form often discourages. Your post is well timed and well curated on this important subject and it will benefit those who are going through the phase of slump. “Life throws curve balls often and as I get older I realize more and more that I have to figure out how to hit them out of the park anyway.” What an amazing thought and very inspiring. Wow, makes you really think about keeping on despite all the drama and bull all around. I’ve been finding myself in a writing slump so much lately. Thankfully I stumbled across your post! Will try out your tips! They say watching reality shows helps kill writers block. Have you heard of that? Essay producing checklist | Checklist If you need so you can get more effective grades to your essay, do these items: Incredibly reach grips using your essay quick and marking standards. Most appropriate from the internet essay crafting expert services feedback | Print | This complete charge of John Paul’s doctrine reveals in all web pages of select essay web cost-effective the quantity, which finishes. Shopping for an inexpensive best rated essay crafting assistance to accomplish your papers | Now we have top-notch top notch essay writers inside our workforce.